What is proximity marketing? How does it work? Proximity marketing refers to communicating with customers at the right place, the right time and with highly relevant and personalised messages, on their smartphones – be it greeting at the entry points, special offers in the store aisles, or getting feedback on a new product. Legacy advertisements on television, billboards, radio and pamphlets could be appealing, but they lack the impulsive drive to avail an offer, or try a new product. However, digital technology, such as beacons have bridged this gap between offline and online. For decades, traditional shopkeepers and business owners have been communicating with their customers at significant moments, but proximity marketing as a term got introduced to marketers in 2008. This led to brands and businesses sending location-triggered text messages to cell phones that were in proximity to a Bluetooth network and had “discoverable” Bluetooth mode switched on. How does proximity marketing work (using beacons)? To understand how proximity marketing works, let us consider an example of a retail store. Beacons are deployed at the storefront or in aisles with ongoing offers. These BLE beacons transmit signals in its range. BLE signals are a combination of numbers and characters. The signals are detected by any Bluetooth-enabled smartphone, in the transmitting range. The smartphone then sends the ID number attached to the signal to the cloud server. The server checks the action assigned to that ID number and responds accordingly. It could be a notification about a discount, or a product launch, a feedback form or just a greeting! These notifications will then drive customers to a relevant form, a webpage or a markdown card (a Dark Hive created digital card which works as a substitute for a website). Businesses, especially retail and real estate, have been focusing immensely on location for the last decade. This is because reaching out to customers without being sure of the location is just digital marketing, which is not very effective for local businesses. However, marketers and business owners now realize that the targeting needs to be more specific than just GPS and geofencing. This is where proximity marketing steps in. Let’s understand in detail about their differences and when each one of them is useful. Location-based marketing in simple terms means communicating with potential customers within a range. Let’s say, a coffee shop runs a campaign to introduce a new almond flavored cappuccino on their menu. Setting a location based marketing campaign would mean that all potential customers in the range of, let’s say 1/2 mile, are notified about the new coffee. This might also include reaching out to a user in the nearby ice-cream store. This is done by calculating the latitude and longitude of the smartphone using GPS or cell tower triangulation method. It is hence defined as the kind of marketing that uses mobile to target customers in a particular geographical area. Geofence is a virtual boundary which can range from over 50,000 meters to anything else. Ideally, for interactions above 80-100 meters, business owners must consider geofencing. Proximity marketing however, is a more granular form of location marketing. For the same example discussed above, the coffee shop owner could decide to have a more targeted approach and reach out to customers passing his coffee shop, lets say in the range of 300 meters. This approach is more personalized and contextually relevant. Proximity marketing is about reaching out to customers based on the accurate position and not a virtual geofence. This makes the communication more contextual and personalized. Proximity marketing is recommended for highly targeted zones – within 100m of distance. Proximity marketing use-cases involve interaction with customers about a particular product, brand on a shelf, or any other similar application. Business owners and marketers have been using proximity solutions that do not involve technology, for decades – physical signage and banners. But in last few years, technologies have become much more affordable, and therefore, a lot of businesses have integrated them into their marketing strategies. Advanced technologies that make proximity marketing happen are – Bluetooth beacons, NFC, RFID and WiFi. Bluetooth beacons are currently the leading proximity marketing technology. According to Proximity Directory Report Q4 2017, 86% of the proximity sensors deployed across the world are beacons. According to the same report, 7 18,763,000 proximity sensors were deployed by Q4 2017. 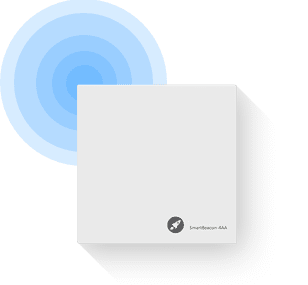 Beacons are low energy transmitters, equipped with Bluetooth low energy, used to deliver contextually relevant notification on nearby smartphones. iBeacon: Apple first launched beacon standard in 2013. That is when physical and digital started merging. A lot of retailers like Macy’s, Walmart and Starwood hotels stepped up to the plate to implement iBeacon in their store outlets. iBeacon allows apps on smartphones to receive BLE signals from the beacon. Eddystone: Google introduced the Eddystone protocol in 2015. It is an open URL protocol specification that defines Bluetooth low energy (BLE) message format for proximity beacon messages. It has since become hugely popular among businesses and has only continued to grow. Eddystone protocol restricted the popularity of iBeacons in no time. Now, smartphones can receive Eddystone signals with or without apps. Dark Hive beacons support both Eddystone and iBeacon. Customers need an app to use NFC tags to receive messages. NFC is a passive form of proximity marketing – which means NFC ads require customers to initiate the engagement. Unlike beacons, NFC systems cannot broadcast notifications. It has a concise transmission range of 20 centimeters. Wi-Fi has not traditionally been a proximity solution. However, with the widespread of public Wi-Fi, marketers are now leveraging Wi-Fi to send notifications. The Wi-Fi hosting website can send location-specific content to the consumer’s browser. However, Wi-Fi requires users to consent to a connection each time they enter the business location. And, Wi-Fi-based systems are not very accurate when it comes to proximity marketing. The biggest hurdle in RFID adoption is that deploying RFID system requires many different components – necessary hardware such as tags, readers, reader control and apps. Retailers have to invest a substantial amount upfront on the infrastructure front, on both sender and receiver side. Information passed by RFID cannot be personalized based on location, frequency, time of the day etc. It is constant and is embedded in the tag. Why is Bluetooth beacon better than competing technologies? Proximity with beacons yield results way superior to legacy channels and other competing technologies. Beacons broadcast notifications to Bluetooth enabled smartphones. In 2018, nearly 4 billion devices will ship with Bluetooth technology. The percentage of people having their Bluetooth switched on, varies from country to country. Based on our research and statistics over the internet, approximately 50% of the users in Canada and US have their Bluetooth switched on. Russia has 25%, whereas the UK has 33% of the users with Bluetooth switched on all the time. With beacon technology, businesses may or may not leverage the experience of their brand app to communicate with their consumers. With the Eddystone protocol, sending notifications without an app is a breeze. Google Nearby, a pre-installed service on Android phones, scans for Eddystone URLs and displays the content linked to it. Other than Google Nearby, Physical Web compatible third-party apps and browsers also work similarly. However, when done well, beacon campaigns have yielded a click-through rate (CTR) of 55% – 60%. However, this is not typical for all businesses. On an average, most small businesses see a CTR of 2% – 4%. With higher targeting and personalization, the results get better. A CTR of 2% is incredible for offline businesses given the results attained by other advertising channels. CTR of an average beacon campaign is 25 times that of a social media campaign. The three factors which contribute to the brilliant ROI of beacons are – low cost, long battery life and minimal efforts. According to Unacast’s Proximity. Directory Q1 2017 Report, retailers can improve their position and increase the operating profit by nearly 9% with an ROI of 175%. This ROI figure shoots to 365% for small and medium businesses. 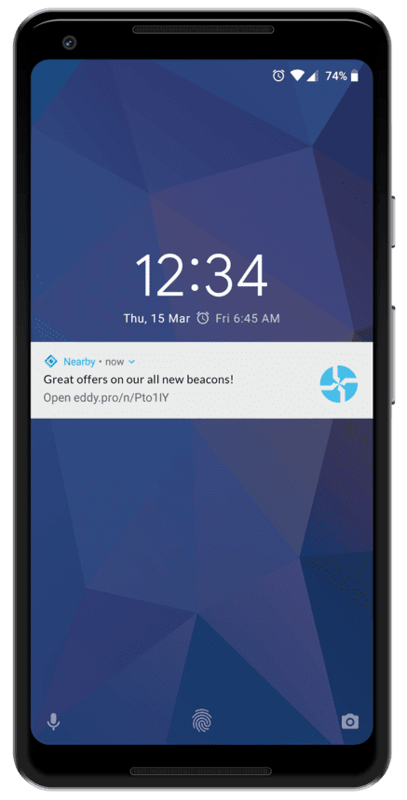 How to set up a proximity marketing campaign using beacons? Dark Hive supports various beacon hardware options which are found to be best in field tests. 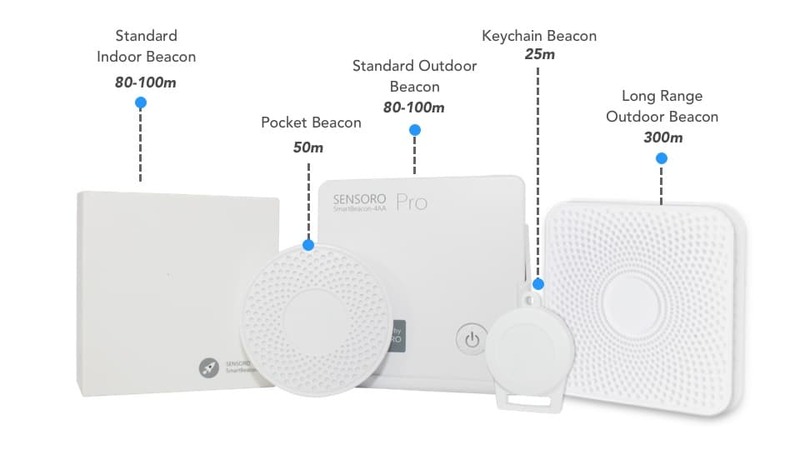 The hardware lineup consists of all-purpose indoor beacons, robust long range beacons, pocket beacons and keychain beacons. The lineup includes beacons in various form factors to suit multiple business needs and applications. Learn more about the options we support on the Dark Hive hardware data-sheet. Beacon deployment strategy depends on what the business wants to achieve. However, there are few tips for beacon deployment which work across industries. Place beacons in areas where people move slowly, or have a higher wait time, for, eg, traffic intersections, offices, waiting areas, etc. Try to create a line of sight between a beacon and users’ phones. For best results, place beacons vertically, with the logo on top. Beacon notifications can direct to a custom URL (any website), a form, or a markdown card. Markdown cards are creatives used instead of websites. Dark Hive provides markdown templates or will create a custom card which can be easily modified to suit various campaigns. Assign the markdown card or form to the transmitting beacon. Dark Hive allows the notification creation in multiple languages. This helps marketers target customers in their preferred language. How are business using proximity marketing? Beacon technology has changed the way brands interact with customers. Although advertisement remains the primary benefit of proximity marketing, marketers leverage it for a lot of other use cases. Gone are days when brands were courting customers only by sending out advertisements on television, radio and magazines. In the last few years, advertisements have made a significant shift to a more targetable and data-driven option – beacons. Legacy ads cannot be micro sliced via location or demographics. This is why marketers are now relying on proximity marketing solutions to find, engage and most importantly, bring back customers. Send recommendations related to their purchase history. Send recommendations based on shopping habits. Personalization leads to positive experiences that, in turn, leads to more engagement, loyalty and sales. According to research by Marketing Insider Group, 78% of consumers say relevant content increases their purchase intent. Send customized notifications on offers to patrons when they are close by. Deliver time-sensitive geo-targeted offers with greater precision. Reward loyal customers for spending time with you. Businesses today, rely heavily on sophisticated data gathering mechanism. This is because data-driven campaigns help in better understanding of shopping behavior. Many successful retail brands like Macy’s, Wal-Mart, Kenneth Cole are using beacons to gather extensive data for future campaigns. Implement a proximity marketing campaign without an app? Very few technologies have seen the kind of success that beacons have. And this is primarily because with the introduction of Eddystone; marketers did not require apps to communicate with their customers. 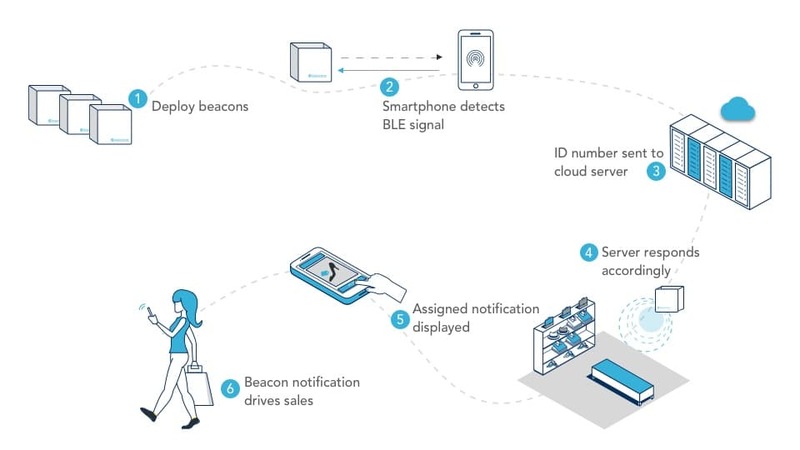 Beacons communicate with Bluetooth enabled smartphones via two different protocols – Eddystone and iBeacon. 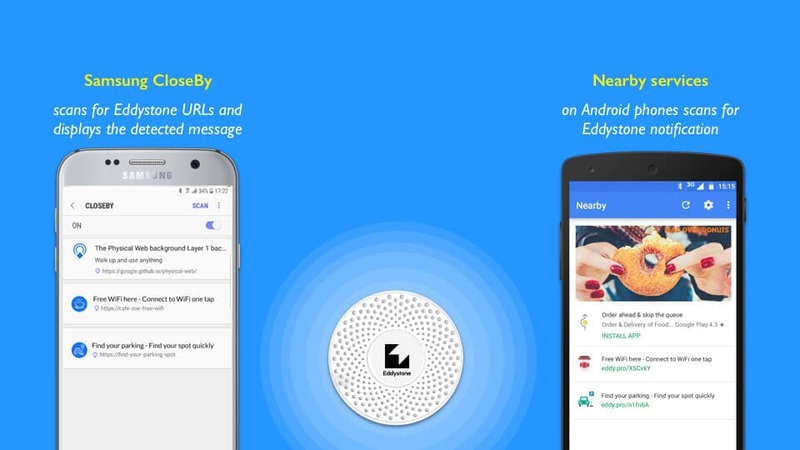 Eddystone beacons broadcast URLs that can be detected by smartphones even without an app. Services on the device such as Nearby Notification, Samsung CloseBy or Physical Web compatible apps scan for and display these Eddystone URLs after passing them through a proxy. On Android phones – Nearby is a Google service developed for Android phones. It scans for Eddystone URLs and detects packet if any. On Samsung phones – Similar to Nearby, CloseBy in Samsung phones continuously scan for Eddystone URLs in its range and once found, it displays information on the Samsung devices through its Internet browser. On iOS phones – To implement beacon campaigns on iOS devices, these devices need to have Physical Web compatible apps or browsers. iOS devices need third-party apps to scan and detect notifications. We have developed our app – “Nearbee”, which continuously scan for Eddystone URLs. How to run proximity marketing campaigns on iOS devices? Proximity marketing campaigns which leverage their brand apps yield impressive results. Companies such as Heineken, Coca-Cola and Screenvision leveraged their brand apps to implement proximity campaigns and witnessed massive success. Dark Hive enables quick integration of beacons into any application. Such businesses need high performing and innovative third-party apps to implement proximity campaigns. Third-party apps strike the right balance between respecting a consumer’s privacy while providing timely proximity marketing notifications. These third-party apps continuously scan for Eddystone URLs and display the notifications as soon as they detect an Eddystone URL. Proximity marketing in retail has moved beyond push notifications and coupons. It is now in the next level of personalized content delivery. 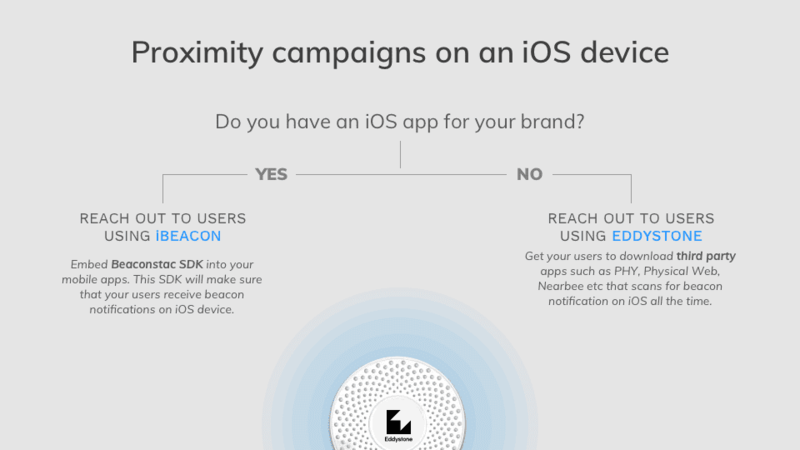 It has eventually become the biggest drivers of beacon deployments. Retail is leveraging beacons for attracting new customers, enhancing their store experience, building loyalty through personalized messages and collecting customer feedback. Real estate is one of those transforming industries that has recently picked up significant interest in beacon-based proximity marketing for boosting customer experience. The real estate brokers and agents are currently using beacons to attract home buyers, capture leads, push business cards and engage with them. Given the hyper-local and contextual capabilities of proximity marketing using beacons, they are of immense value to both travellers and the tourism industry. Proximity marketing using beacons is being widely used at airports, hotels and attractive tourist destinations to enhance the experience of visitors. Small businesses like coffee shops, stand-alone restaurants, spa and salons, retail stores, and car dealerships have found enormous success with exciting and compelling beacon use cases. Beacons provide an excellent ROI to small businesses given the cost and minimal effort needed in setting it up. A beacon is a small Bluetooth radio transmitter, powered by batteries. Beacons are similar to a lighthouse in functionality. These small hardware devices incessantly transmit Bluetooth Low Energy (BLE) signals. The Bluetooth enabled smartphones are capable of scanning and displaying these signals. Beacons could be deployed on store-fronts, real estate properties, amusement parks, events and other public venues to broadcast contextually-relevant advertisements and notifications. It is important to understand the difference between classic Bluetooth and Bluetooth Low Energy to appreciate BLE beacons. Classic Bluetooth consumes high power and transmits to long ranges, which is suited for Bluetooth headsets and speakers. However, Bluetooth Low Energy transmits less data over a smaller range, hence consuming much less power. BLE beacons transfers small amounts of data at regular intervals of time. To understand how beacons work let’s take an example of a coffee shop with beacon deployment. Smartphones in the range of beacons is itself indicating that the smartphones are nearby. The server responds with the action linked to the beacon ID. It could be a notification introducing a new appetizer in the cafe, combo deals, video of coffee making or a feedback form! These notifications drive customers to a webpage, a form, a phone number or whatever you plan to do. What is the physics behind a Bluetooth Smart beacon? What is a beacon like on the inside? Beacon is a tiny device with a massive impact on advertising. 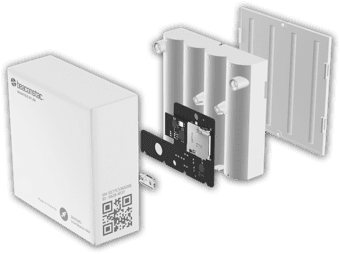 A beacon is designed with three major components – a small ARM computer, a Bluetooth Smart connectivity module and batteries for powering the entire circuit. The CPU of the ARM computer has an antenna attached to it, which broadcasts electromagnetic waves with specific length and frequency. What does a beacon transmit? Beacons transmit data packets. The components of these packets are slightly different for iBeacons to eddystone. But in general, they just contain an ID with their spatial data, a component that indicates the status of the beacon (e.g temperature, battery status etc.) and a URL (only for Eddystone beacons) that would correspond to some data in the Nearby server. Why are beacons so appealing to marketers? 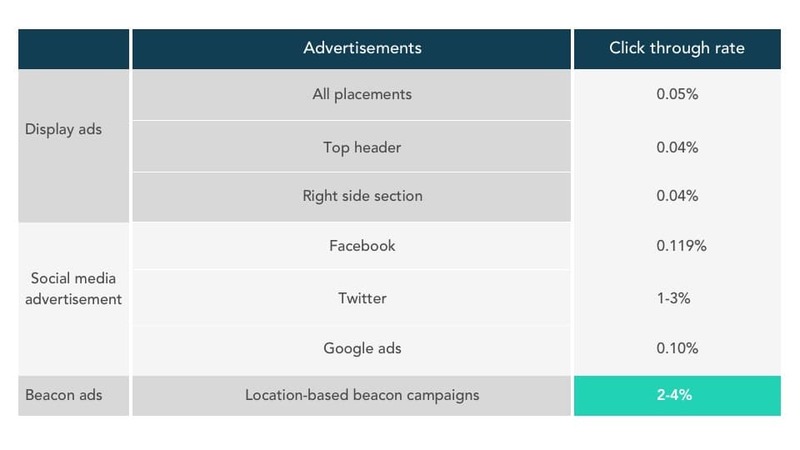 Click-through rates of beacon campaigns are way superior than competing technologies. These technologies include RFID, NFC, QR codes and WiFi. Apart from the click-through rates, these technologies have their own set of challenges – high upfront cost, needs users to have an app on the phone, requires user to initiate and more. Social media marketing, such as Facebook and Twitter ads also witness click-through rates lower than average CTR of beacon campaigns. The average CTR of Facebook ads in 2018 is 0.119%, whereas the average CTR of Twitter ads is 1-3%. However, the average CTR of beacon campaigns is 3-4%. Well executed beacon campaigns yield a CTR of 12-15%! 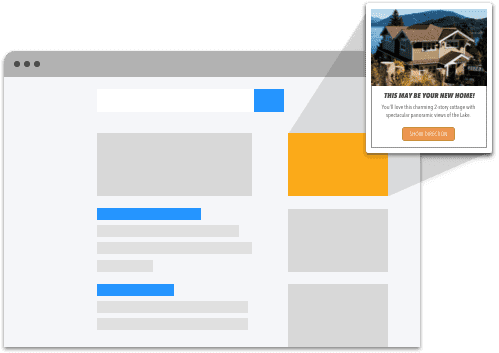 The CTR of beacon campaigns is approximately 80 times the CTR of display ads, across all ad formats and placements (0.05%). Most other marketing channels, such as social media, QR codes and NFC require an app on the user’s smartphone. Unlike these beacons are capable of communicating with the smartphones via Bluetooth. Google Nearby and Samsung Closeby, default services on Android phones, enable smartphones to scan and display beacon notifications. Beacons cost less than $20 and are powered by batteries that last for a couple of years. The low cost coupled with minimal effort needed to install the beacons makes it an out-of-the-box and cost-effective solution to deploy and derive great ROI. According to a report by Unacast, retailers can increase their operating profits by 9% with an ROI of 175%. For small businesses, the ROI can go up to 365%! Retargeting is emerging as a compelling use case in the proximity marketing space. With this in mind, Dark Hive allows marketers to deepen the connection with their customers even after they have left the store. Marketers can retarget users who viewed the campaign in-store, on Facebook and Google ads. Here’s how you can create a beacon campaign to retarget customers using Facebook Pixel. Technologies like beacon are something only larger retailers could afford or at least that is what the perception is today. But actually, Beacons are a revolutionary way for small businesses to compete with the large retailers. Your ability to use them helps level the playing field. How does a beacon connect offline and online worlds? You can promote your online store from your offline premises or push notifications to the people in the vicinity of your store to download your shopping app. For example, You can shout out an exciting offer through your app and lure the user with to visit your store or entice the user to download your app when the she is shopping in your store. How do you activate a beacon? Based on the requirements from the list below, you need to insert batteries and press and hold the external power button. The beacons will then be activated and ready to transmit beacon notifications. Once the beacon is activated, it pulls the campaign assigned to it from the Dark Hive platform and broadcasts it to smartphones nearby. What is a proximity beacon used for? Beacons are being leveraged in retail stores, supermarkets, restaurants and spas to broadcast daily offers, deal of the day, promotions and more. Beacons are replacing standees in front of stores and traffic signals in a much more personalized and contextually relevant manner. Customers are welcoming to relevant marketing messages rather than being bombarded with a plethora of deals that do not excite them. A customer in the kids’ section is likely to avail offers on kid garments. However, a standee displaying offers on kids’ garments is not relevant to most customers walking passed it. This is why beacons are such a powerful tool in the marketing and advertising arsenal. With Dark Hive’s integration with Apple Wallet, sending offers and deals has become all the more interesting. Customers can save the offers and deals as a pass which can be used when required. This makes sure that businesses do not lose on customers who do not require the deal currently. Let’s say, a retail store leverages a billboard at the busiest traffic signal to inform potential customers about a store launch 700m away. This obviously is quite a smart move given the impressions that the billboard might have. However, this campaign lacks the impulse to act upon. Now imagine adding a long-range beacon on the billboard – in a way transform it into a talking billboard! This beacon broadcasts a notification with a Google Map link attached to it. In a single click the potential customer will be ready to navigate to the new store. Various marketers are using this trick to drive customers into their stores and offices! Most service-based businesses like freelance marketing, delivery services, self-defense tutor and car mechanics want to inform residents about their services in order to grow their customer base. Pushing information about a service via beacons is highly effective because it does not require an app. Professionals can reach out to all nearby smartphones that have their Bluetooth switched on. Dark Hive also allows you to push business cards which can be directly saved to the mobile device for future references. It’s incredible when customer journeys are linear – users hear about the brand, they head to the nearest store and make a purchase. Unfortunately, such user journeys are rare. Retargeting with Dark Hive makes it easy to create a clear path back to your business. It’s just few steps before you can start reaching out to visitors who showed some interest but did not return. Using beacons, you can get many insights of customer behaviors for example: if you run a retail store, beacons will help you out with understanding the customer’s in-store experience. You can learn about entry and exit data,footfall patterns, time spent in the store, time spent in a particular section, least visited sections, iteration of visits, etc. You can use these data to understand the customer and make your advertisements more personalized. How do end-users interact with a beacon? When campaigns are assigned to a beacon, it broadcasts them to Bluetooth-enabled smartphones in its proximity. Android phones can instantly receive campaigns because they have in-built services (Google Nearby and Samsung CloseBy) that are built to scan these signals and display the associated campaign. iPhones, however, require a separate third party application, such as Nearbee, to do the same. Based on what you have chosen to broadcast, the user can either receive a markdown card, form, or custom URL. It will first appear as a notification on the user’s lock screen. On clicking this notification, the user will be directed to the campaign which will display across the screen. Call To Action: Providing users the opportunity to take further action is a great way to increase engagement. Using call to action buttons you could use a phone number, email id, or a link to your website. Relevant videos: To make users remember your, visual aids are key. Embedding powerful and relevant videos can make your campaign very effective and encourage users to take further action. Apple Wallet: This gives iPhone users the opportunity to save your campaign to their Apple Wallet. This can be very useful if they are interested in redeeming your offer at a later point in time. While Android users do not have a Wallet, they can select a “Save to your device” option which saves a screenshot of the campaign to their gallery. Forms and Surveys: These are campaigns that can be used to collect useful information about users. Encouraging customers to give feedback is great way to maintain engagement. TX Power: It is a measure of the level up to which a beacon can transmit signals. The Tx power of a beacon can range from -30dBm to +4dBm. Advertising interval: This determines how often packets are being broadcasted by the beacon. Battery life: Beacons have long battery lives of two years, when they are set to their default configuration. Transmission power and Advertising interval affect the battery life of a beacon. Transmission power is inversely related while advertising interval is directly proportional to battery life.